We are providing the best quality of PVC Flexible Hose Pipe to our customers. 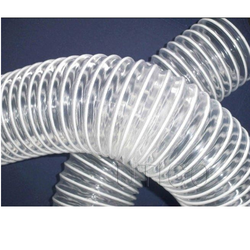 In keeping with our theme of client satisfaction, we are offering PU Transparent Flexible Hose to our clients. Available in different dimensions, it is designed to withstand pressure and other unfavorable factors. This is based on law of hydraulics. This PU Flexible Hose is reckoned for its excellent quality and is free from all types of defects. We are offering our range at economical price to clients. 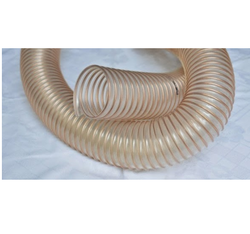 Flexible Transparent Tubings 1" to 8"
PVC Transparent Flexible Hose are made of specially formulated PVC compounds. These flexible PVC transparent tubings are physically tough, abrasion-resistant, non-ageing and self-extinguishing. The Smooth bore of the tubing prevents interior build-up and provides outstanding flow characteristics. The tubings are unaffected by moisture, mild acids, alkalis and offer resistance to various organic/inorganic chemicals. They offer adequate resistance to pressure. However, the working pressure is dependent on temperature, wall thickness and material handled. As the tubings are made of thermoplastic material, working temperatures should be considered for end use applications up to a maximum of 60°C. Applications: In conveying liquids and gases in various chemical, pharmaceutical, automobile industries and laboratories for low pressure uses; and garden hose for watering gardens, lawns, tea / coffee plantations, domestic applications and spraying of water/insecticides in crop plantations.